I live in the small town of Kingston, where nothing much ever really happens, and we like it that way. But it wasn’t always this way, Kingston has a little bit of history when it comes to the founding of this country. 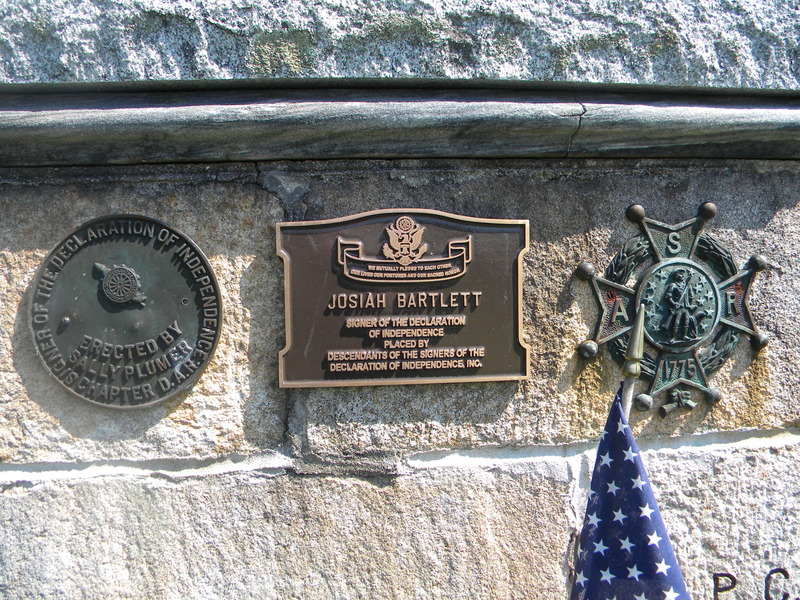 Kingston is the town that Josiah Bartlett called home. Who was Josiah Bartlett? You wouldn’t be alone in asking that question, history has seemingly forgotten him. Josiah Bartlett was appointed as a delegate for New Hampshire to the second continental congress in 1776. When the vote for independence was taken it was Josiah Bartlett who was called on first and cast the first vote in favor of independence. When the Declaration of Independence was signed, Josiah Bartlett was the second person to sign. According to folklore, Josiah Bartlett personally took the pen from John Hancock before he attached his signature directly below the most famous signature in United States history. Josiah Bartlett (1729–1795), was an American physician and statesman who, as a delegate to the Continental Congress for New Hampshire, signed the Declaration of Independence. He was later Chief Justice of New Hampshire’s Supreme Court and Governor of the state. Josiah was born in on November 21, 1729 to Stephen and Hannah (Webster) Bartlett in Amesbury, Massachusetts. He was their fifth child and fourth son. He attended the common schools, but with uncommon success. By the age of sixteen, by study, he had also built a foundation in Latin and learned some Greek. In 1745 he began the study of medicine, working in the office of Dr. Ordway of Amesbury. Before he turned twenty-one, in 1750, he moved to Kingston, New Hampshire in Rockingham County, hung out his shingle and began his practice. Kingston at that time was a frontier settlement of only a few hundred families. If a man could stitch wounds, set bones, and treat fevers, he was welcome, even without formal educational credentials. Dr. Bartlett could, and as the only Doctor in this part of the county, his practice prospered. He purchased land and added a farm to his credit. On January 15, 1754 he married Mary Bartlett of Newton, New Hampshire. She was his cousin, the daughter of his uncle, Joseph. They would remain a devoted couple until her death in July 14, 1789. Over the years they would have eleven children: Mary (1754), Lois (1756), Miriam (1758), Rhoda (1760), Hannah (who died as an infant, 1762), Levi (1753), Josiah (1765, died that same year), Josiah (1768), Ezra (1770), Sarah (1773), Hannah (1776, also died as an infant). All three of his sons, and five of his grandsons would follow him as physicians. Like many prominent men in small communities, Bartlett became active in the political affairs of Kingston, and in 1765 he was elected to the colonial assembly. In 1767 he became the colonel of his county’s militia and Governor John Wentworth appointed him justice of the peace. As the Revolution neared, his Whig policies brought him into opposition with the Royal Governor, John Wentworth. In 1774, Bartlett joined the Assembly’s Committee of Correspondence and began his work with the revolutionary leaders of the other 12 colonies. Later that year, when Wentorth dismissed, or prorogued, the Assembly, Josiah was elected to its revolutionary (and illegal) successor, the Provincial Assembly. He also suffered the loss of his home by fire, alleged to have been set by opposition Tories. He moved his family out to the farmhouse and began rebuilding immediately. 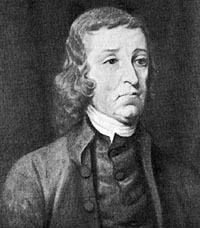 When the assembly appointed Bartlett and John Pickering as delegates to the Continental Congress, he had to decline because to attend to his family, but remained active in New Hampshire’s affairs. In one of Governor Wentworth’s last acts before being expelled from New Hamsphire in 1775, he revoked Bartlett’s commissions as Justice, Militia Colonel, and Assemblyman. Bartlett was selected as a delegate again in 1775, and attended that session as well as the meetings 1776. Indeed, for a time in late 1775 and early 1776 he was the only delegate attending from New Hampshire. Much of the work of the Congress was carried out in Committees. The most important of these had a delegate from each state, which meant that Bartlett served on all of them, including those of Safety, Secrecy, Munitions, Marine, and Civil Government. His attention to detail and hard work in these committees made him one of the most influential members in the Congress, even though he was seldom active in debates before the full congress. Eventually, after his continued letters home to the Assembly and Committee of Safety in New Hampshire, William Whipple and Matthew Thornton were added to the delegation in Philadelphia. When the question of declaring independence from Great Britain was officially brought up in 1776, as a representative of the northernmost colony Bartlett was the first to be asked, and answered in the affirmative. On August 2, 1776 when delegates signed the formal copy of the Declaration of Independence, his position made him the second to sign, just after John Hancock, the president of the Congress. In 1777, he declined a return to the congress, citing fatigue due to earlier efforts. But when trouble threatened, he used his medical skills and accompanied John Stark’s forces to the Battle of Bennington in August. He was re-elected to Congress in 1778, and served on the committee that drafted the Articles of Confederation. But, after the articles were adopted, he returned to New Hampshire to attend to personal business. This was the last of his federal service, as he felt he had overlooked his family for too long. Indeed, while he was at the Congress in 1776, his wife Mary had managed the farm, saw to the completion of rebuilding their house, cared for nine children, and given birth to Hannah. Although he remained in the state after 1778, in 1779 he returned to his role as a Judge, serving in the Court of common pleas. Then in 1782 he was appointed to the New Hampshire Supreme Court in spite of not being a lawyer. Indeed, some contemporary lawyers held the view that justice was never better than when the senior judges knew little legal history. In 1788 Bartlett was made the Chief Justice of the state’s supreme court. That same year he was a delegate to the New Hampshire convention for adoption of the Constitution, serving part of the time as is Chairman. He argued forcefully for ratification, which finally took place on June 21, 1788. The legislature of the new State of New Hampshire, selected him to be a U. S. Senator, but he declined the office. In 1790 Josiah’s lifetime of contribution received its highest recognitions. He secured legislation recognizing the New Hampshire Medical Society. He was also elected chief executive of New Hampshire by an overwhelming majority. He served in 1791 and 1792 as President. Then when the new State Constitution took effect in 1792 he continued, now as governor. He resigned in 1794 after four years because of declining health, he died the next year. During his tenure, he oversaw the installation of a new state constitution, compilation of the laws and statutes in force, and provision for the early payment of the State’s debt. He actively promoted agriculture and manufacturing, the improvement of roads, and saw the start of projects to build canals to better unite the people. Bartlett actively practiced medicine for 45 years. From a modern perspective, this alone would be a major accomplishment. He had no university training, and left school at the age of fourteen. In effect, he apprenticed with another Doctor, and set up a practice at the age twenty. But, he was willing to consider what worked, and avoided some traditional therapies such as bleeding. His reputation was firmly secured in 1754. The area around Kingston had an epidemic of a fever and canker simply called throat distemper around 1735. For adults it was a serious illness, but for children it was frequently fatal, especially among the very young. When the illness struck again in 1754, Dr. Bartlett simply tried doses of several available drugs, and discovered that Peruvian Bark would relieve symptoms long enough to allow recovery. Bartlett lived during a time when medical practice was progressing rapidly. His wide reading, steady hands, and conscientious work made him an effective and successful physician. He founded and was the first president of the New Hampshire Medical Society. In 1790 he delivered the commencement address at Dartmouth College when his son Ezra graduated. In part, the honor was due to his signing of the Declaration of Independence, and his new selection as President of New Hampshire. But, in part, it was a recognition of his medical career. He was awarded an honorary MD (Doctor of Medicine) the same day his son earned that degree. He retired to his home in Kingston, and died there on May 19, 1795. He is buried next to his wife Mary in the Plains Cemetery, also at Kingston. A bronze statue of Bartlett stands in the town square of Amesburry, Massachusetts. His portrait hangs in the State House in Concord, New Hampshire, drawn from an original by Jonathan Trumbull. Bartlett, New Hampshire is named in his honor, and The Josiah Bartlett elementary school is a visible presence on its major roadway. The great man now lies buried in a cemetary that is within a half of a mile from my house. While nothing much happens here in this quiet town, Kingston has much to be proud of in her history and the history of America. I think the way things are going, living in a town that nothing much happens in is a great place to be. I think so, I love it here. My dad grew up in a little place called Mazomanie, Wisconsin, it also was great. I happened to be born in East St Louis, Il and stayed in that area. Went to Madison, Wisconsin for 3 years during high school, but what a liberal city, wow! Then back to St. Louis area until 24 years ago, now in Decatur, Illinois. This place has big problems, but the job is here. Retire in about a year….who knows from there. Wish I had stayed in one place, but that didn’t happen. I envy anyone that can have good strong roots and many generations all in one place to grow up. Thank you for telling me about this piece. I didn’t know about this at all. Nice article. I left New Hampshire years back after being born there and living there most of my life. I found the State to be backwards in their Laws, Courts, and Government. After living in Minneapolis, Minnesota for years now …I found out that I was so right. But, I must say you have changed my mind on one thought I had about New Hampshire. There are some intelligent ones that live there. Not all are backwards. With the exception of the anti-Bush wave that swept nanny state politicians into power not too long ago, New Hampshire has always been a small government, anti-nanny state, live free of die, liberty loving state. I love the fact that NH state legislators are part time positions which only earn about $200, this means they all have real jobs and understand how their policies will effect the workplace.